Reservation Blues revisits the characters of Thomas Builds-the-Fire, Victor Joseph and Junior Polatkin, first written about so memorably in the 1993 short story collection The Lone Ranger And Tonto Fistfight In Heaven (read my review here). 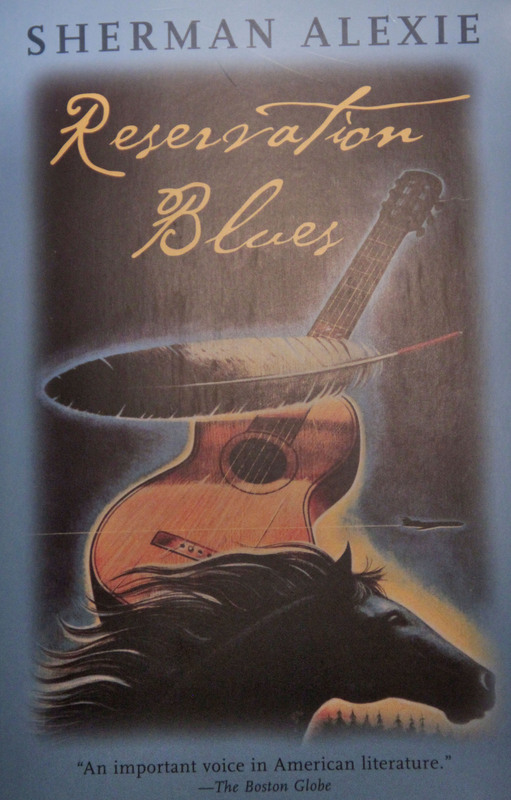 In Reservation Blues, long-dead and legendary Blues musician Robert Johnson somehow makes his way onto the Spokane Indian Reservation and quickly disposes his famous guitar into the hands of angry (and mostly drunk) Victor Joseph, who from that moment on, plays a mean guitar. Together with his best buddy Junior and Thomas, he starts Coyote Springs, a band that after some rocky beginnings manages its way off the reservation (‘’anywhere off the reservation,’ Thomas said ‘ ,is along ways from the reservation’’), first to the Flathead Indian Reservation and later to Seattle, eventually landing in New York City. In between they get helped and/or distracted by a variety of imaginatively conceived characters, such as Flathead sisters Chess and Checkers Warm Water and Seattle New Agers Betty and Veronica, who briefly join Coyote Springs only to leave both the band and the reservation because ‘it’s nuts here’. Also always lurking in the shadows are the-man-who-was-probably-Lakota and Big Mom, a mystical figure living high up on Wellpinit Mountain where she is joined by Robert Johnson. Things take a decidedly turn for the worse after the audition in New York City goes less than ideal and the hoped-for path to stardom curtailed. Back on the reservation, Junior takes his own life and the band gets scattered with the wind. Things of course don’t go by without a myriad of complications and hiccups, such as various little and big tiffs between various members of Coyote Springs, beautiful Checkers Warm Waters falling in love with the reservation priest Father Arnold, and the continuing struggle with money worries. The writing is once again wonderfully unique and steeped in mystique, such as in the last sentence of the book ‘Checkers and Chess reached out of their windows and held tightly to the manes of those shadow hoses running alongside the blue van’. I wasn’t that totally captivated by his writing style as when I was reading The Lone Ranger And Tonto… but that might only because the short story collection was the first book I read by Sherman Alexie and his writing style was brand new to me then. As in that book, the humdrum tragedy of life on an Indian reservation are very much in the focus of the book, as witnessed in conversations such as this one by Father Arnold and Checkers Warm Waters: ‘Does everything have to be about money?’ ‘Of course it does. Only people with enough money ever ask that question anyway’. Speaking for Sherman Alexie is the fact that none of the often rather serious subject matter is written in an educational or preachy way. On the contrary, he manages to convey the things he wants to say in an often downright hilarious, even wacky way, without sacrificing his messages or diluting the comments and observations of the harsh realities of life on an Indian reservation and the continuing struggle Native American society is experiencing. Which is one of the main reasons endearing his work to me so much. Reservation Blues is an extraordinarily well-conceived story featuring a great cast of memorable characters. All of which are written about with loving attention to detail, culled both from reality and the inventive mind of Sherman Alexie, who as a mixed Spokane/Couer D’Alene is uniquely well-adapted to write about these things. As for my attraction to his writings and all things Native American, that attitude of the ‘white man’ gets addressed numerous times in the book too, such as in the scenes with Betty and Veronica, so that’s given me a chance to reflect on my motivations, which is making his books particularly relevant to myself and a lot of other people reading them. This entry was posted in Books and tagged Books, Literature, Native American Interest, Reservation Blues, Sherman Alexie. Bookmark the permalink. I am a fan of Sherman Alexie and have something of us in my cue. I forget what. Grabbed it on impulse from library. My book cue is embarrassingly long. Also, I like Robert Johnson, the music and the myth. I don’ t like the jerk who controls the rights to his only photos, however. I own two paintings that defy the copyright. My blog tells me that Jay likes my blog. Not sure if this is true or mechanical ghosts merely want me to think so. Isn’t it pretty to think so? (that’s not Alexie that’s a Hemingway ref). A borat could not have written this. I mean robot. Regards. How would you compare Sheman Alexie and Louise Erdrich? Reservation Blues is one of my favourite novels. Actually, for me it’s the other way around. I read Lone Ranger first and loved it, but I completely fell in love with Reservation Blues, I think because of his complexity, the way everything connects to everything else, which – being a novel rather than a collection of stories – in Reservation Blues happens in a more organic way.